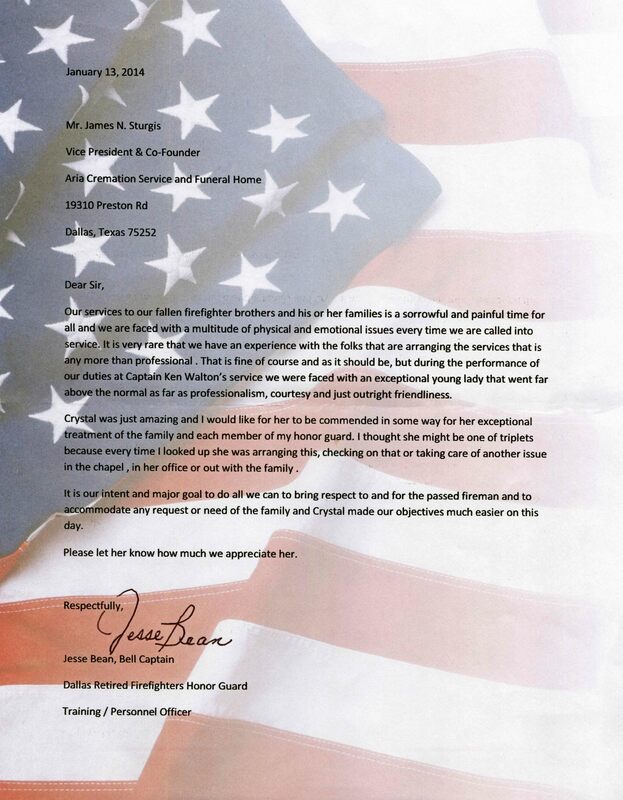 Our services to our fallen firefighter brothers and his or her families is a sorrowful and painful time for all and we are faced with a multitude of physical and emotional issues every time we are called into service. It is very rare that we have an experience with the folks that are arranging the services that is any more than professional. That is fine of course and as it should be, but during the performance of our duties at Captain Ken Walton’s service we were faced with an exceptional young lady that went far above the normal as far as professionalism, courtesy and just outright friendliness. Crystal was just amazing and I would like for her to be commended in some way for her exceptional treatment of the family and each member of my honor guard. I thought she might be one of triplets because every time I looked up she was arranging this, checking on that or taking care of another issue in the chapel, in her office or out with the family. 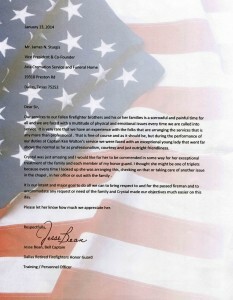 It is our intent and major goal to do all we can to bring respect to and for the passed fireman and to accommodate any request or need of the family and Crystal made our objectives much easier on this day. Please let her know how much we appreciate her.